Gary Garner’s book Swept Up by the Spirit is the true first person account of how God can take a non-religious home builder and turn him into a dynamo of Holy Spirit power. Each chapter in his book tells about a different encounter with God in ways that will awe and inspire you. 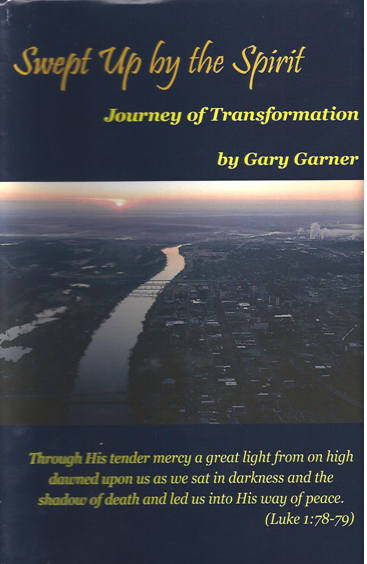 Gary subtitles this book “Journey of Transformation” because he starts out like all of us, not terribly religious and not at all interested in becoming so. Then his home building business and his life fall apart so disastrously that he seriously considers driving full speed into a guard rail so his family can get the insurance money. A reluctant prayer request for a good night’s sleep at a prayer meeting unexpectedly blasts Gary into a new life in the Holy Spirit, instantly redirecting his incredible talent, intelligence and drive into an “all-in” adventurous partnership with God. The contents are divided into sections. Part 1 “First Encounters” tell of his conversion. Part 2 “Yes, Lord, Send Me” details his growing ability to learn to trust God’s leading in his personal life as he reaches out to others with the touch of God’s hand. Part 3 “Your Will, Lord – Not Mine” details his deepening faith walk that enables Gary and his wife Nancy make major life changes including moving to a Christian community. Part 4: “Grace Abounding” detail some of Gary’s further adventures in God’s grace. Warning – you will be so swept up reading this book you won’t be able to put it down! You’ll love the straight shooting yet extremely descriptive writing style of Gary that makes you feel as if you’re right there with him every step of the way. He lets us into the thoughts going in his head – and we recognize ourselves. And then Gary astonishes us by allowing the Holy Spirit to overcome our normal fears, misgivings and inhibitions with incredible results. His life is dramatically changed and his marriage is repaired. People are healed, financial recovery takes place, new creative businesses are launched, bars are shut down and even homeless people fall down overcome in the spirit. The list of “God interventions” goes on for 288 power packed pages. Not only is this book inspiring, but it will also help answer some of the questions you have about the baptism of the Holy Spirit, whether God still heals in our day and standing against evil influences in your community. If you’re at all interested in prayer, this book will reinforce with structural steel your notion that God does indeed act in powerful ways when we pray with and for others. From Gary’s example you’ll learn how to act on the slightest nudge of the Holy Spirit to prayerfully approach others in need of spiritual or physical help. You will learn how to operate using the gifts of the Holy Spirit. And you will learn how to hear God’s directions for you on any ordinary day.